On Friday, November 9th, STEM in the Park – with help from sponsors IBM, Devada, Research Triangle Foundation, and AmeriCorps VISTA—hosted its first ever TechFest! One hundred and sixty students from seven North Carolina schools (Brogden Middle, Smith Middle, Chapel Hill High, C.W. 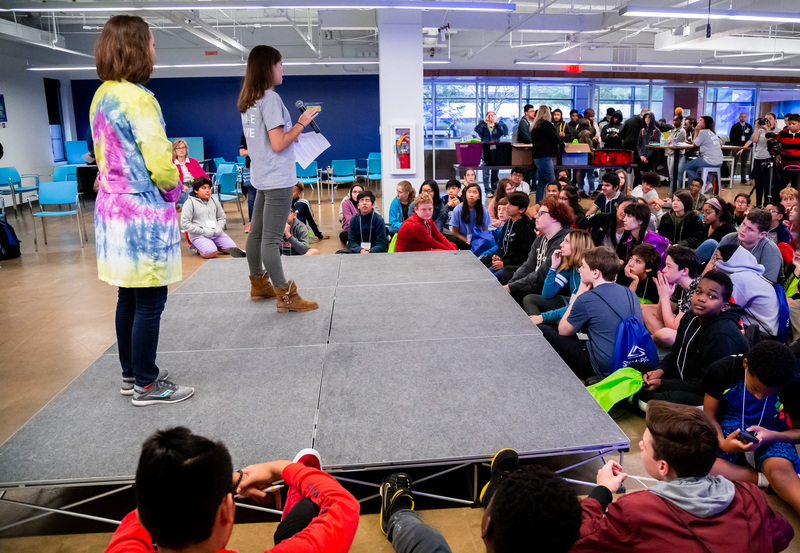 Stanford Middle, East Cary Middle, Hillside High, and Shepard Middle), discovered the personal journey behind the career, experienced a glimpse inside tech careers and solved tech challenges like a pro! 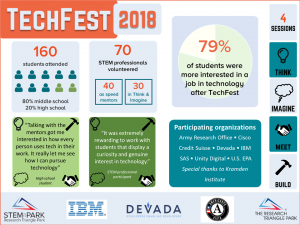 TechFest is the first of three STEM Fests this year (TechFest, EMFest, SciFest) and is specifically aimed at connecting students directly with STEM professionals. This new STEM Fest model includes four engaging sessions: Think, Meet, Imagine, and Build. Students rotated between these sessions, talking to STEM experts, realizing that they too are capable of pursuing STEM careers. 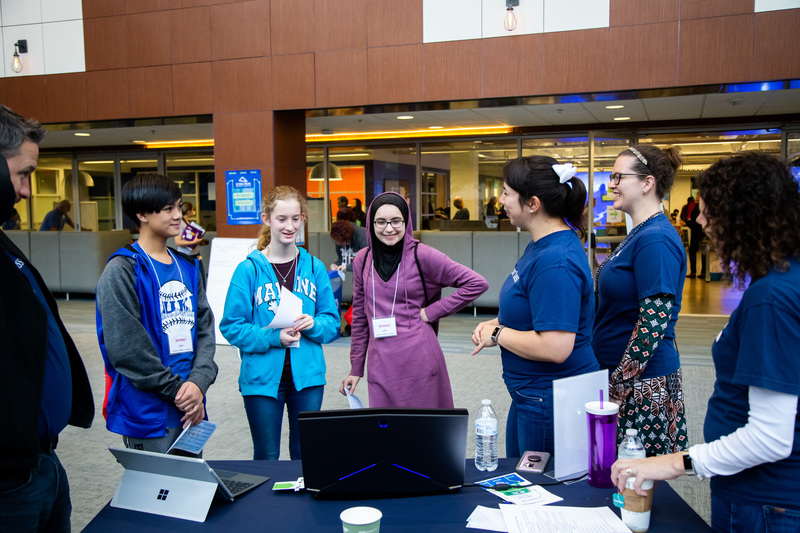 After TechFest, 79% of the students that attended said that they were more interested in pursuing a career in technology than they were before attending! 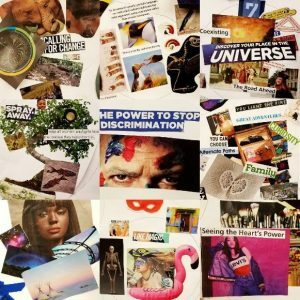 During Think, the students solved real-world problems in partnership with STEM professionals using design thinking principles. The students worked in small groups with one of four organizations: IBM, Cisco, Devada, or Unity Digital. These companies each had a team of representatives guiding students through challenges that their organizations face. The students were able to come up with tangible solutions, reinforcing the value of their ideas and aptitude in real-world problem solving. 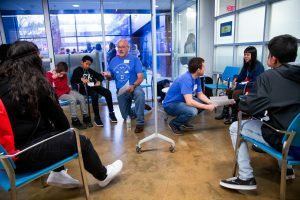 This session was designed with the help of District C.
During Meet, students spoke directly with multiple STEM professionals from local organizations including Cisco, BD, Fidelity, Bayer, and Syngenta. 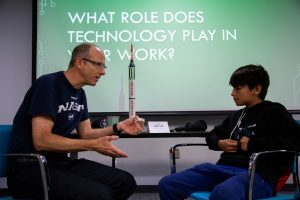 In Imagine, Credit Suisse, Devada, SAS, US Environmental Protection Agency, and the Army Research Office engaged the students with hands-on demonstrations, providing an immersive experience for kids to understand what these careers look like every day. These organizations wowed the students with artificial intelligence, particulate matter sensors, and K-9 military tech! 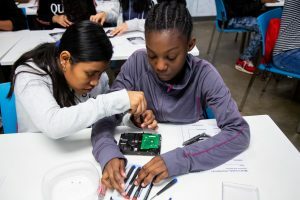 Build was run by Kramden Institute, a partner of STEM in the Park. The Kramden organizers, Marshall and Lyle, showed students how to open hard drives with screwdrivers and explained the mechanics of this delicate and complex technology. Lunch was provided by Publix for the students and Jimmy John’s for the participants. During lunch, students were able to take part in a new collaging activity that helped them think artistically, inspiring more innovative ideas and confidence in their creations. TechFest was an absolute success! One of the many benefits was a new outreach collaboration between Credit Suisse and a local school! 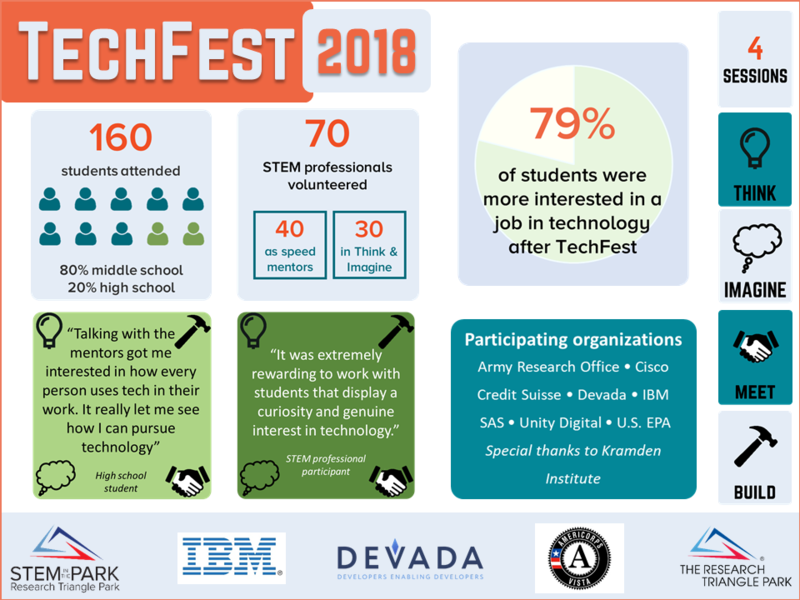 For more specific statistics from TechFest, see our infographic below. STEM in the Park would like to express our deepest appreciation for everyone who helped with this incredible event, including Kevin Seifert Photography and Two Dots Communications. 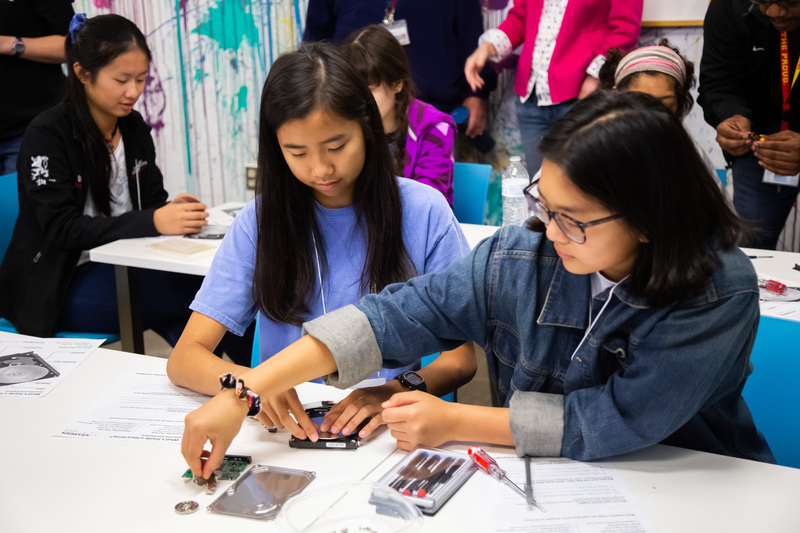 If you’d like to be a part of our future STEM Fests, click the links below or email us today at STEMinthePark@rtp.org! Sign Up for Our Upcoming Fests!